This month, our family decided to do a little home cooking-challenge. For the next 4 weeks, we'll be researching, prepping and taste-testing some new healthy recipes that come highly rated. I would chalk this first recipe up to a family success! It was easy, fun to make and delicious to eat. Even our 2 year old daughter, Chloe, was able to get in on the action (I think she earned the award for cutest corn husker). Remove husks from ears of corn, clean, and cut kernels from cob. In a 4qt dutch oven heat oil over medium heat. Add onions, salt, pepper and cook about 5 minutes. Next, stir in thyme and garlic until fragrant then slowly add broth, bay leaf and bring to a boil. Simmer, uncovered for 10 minutes. Stir in zucchini and corn kernels and let simmer for another 5 minutes. 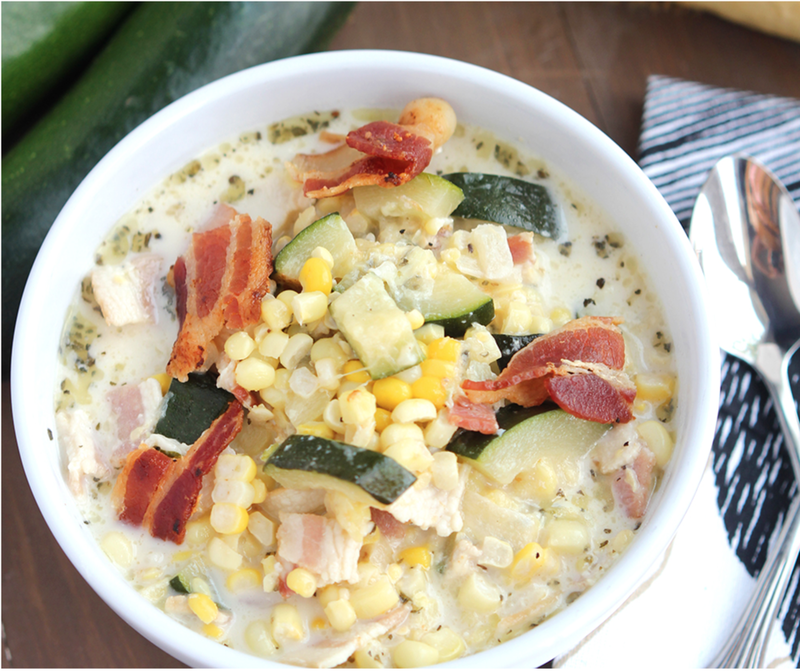 Serve soup into bowls and sprinkle the crumbled bacon on the top. TIP: for a Veggie option, substitute vegetable broth for chicken broth and bacon for kidney beans. Let us know what you think! 172 Calories, 20g carbs, 3g fiber, 9g protein (no joke! ), 35 minutes to make.